Right now, Friday night, I would have been on a plane headed for Heathrow London. I would either be posing with champagne because I had sucked in my stomach hard enough to get a free upgrade. Or sitting in economy between two people, one snoring and the other coughing. Either way, its destination MUM and I had been looking forward to this (you too) since March. On Monday came the email from Davids family requesting me not to go. Not that I was going for long, however, it seemed far too much to expect. The plans I had arranged, the number of people and my 'handy tips' did not feel a strong enough network of support for them. I'm the only one who can calm him, perhaps they do not know the times that only exhaustion has done that. 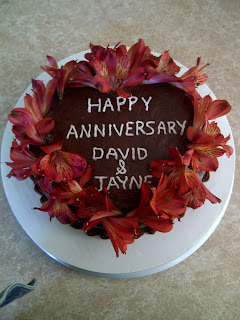 On Saturday May 12, David and I celebrated our tenth wedding anniversary. We gently held hands and telling him I loved him I gave him a wedding ring and he gave me a wedding ring. Ten years and no wedding rings - it was time to make it official! Of course this is what was meant to happen. We never even made it to the Inn that Shannon had organized including champagne, strawberries and a gorgeous cake. We had left the house at 9:45am and though I kept expectations low, I couldn't help feel quietly excited. I had even managed to pack a suitcase in the car without being seen. We stopped at the first panic and I explained everything I had planned and why. We stopped at the second panic and I did the same. By the time the third panic arrived, I had missed a turning and just knew it was time to press HOME on the GPS. We were indeed home by 12:30, I was declared the devil and we sat in the garden while David slept and I pretended to be content.